Research in the past has resulted in better control with perennial broadleaf weeds, like dandelions, in the Fall compared to Spring applications. So after a little brainstorming we decided to apply this concept to controlling bermudagrass before dormancy. This way the bermudagrass would have the dormant look throughout the winter but would be ready for renovation in the Spring. 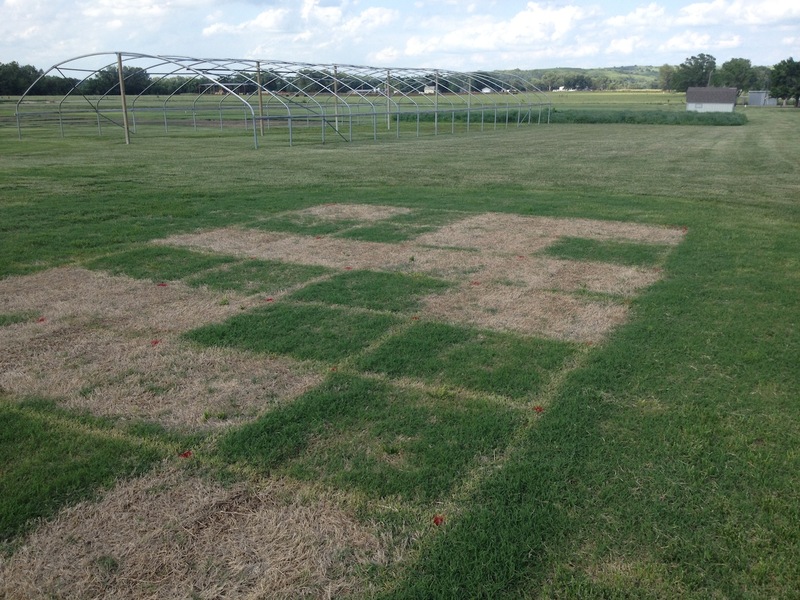 Research was conducted at Rocky Ford Turfgrass Research Center and Stagg Hill Golf Course in Manhattan, KS to determine bermudagrass control with glyphosate, mesotrione, and fluazifop applications prior to dormancy. Applications were made on October 3, 2013. Treatments consisted of a non-treated control, glyphosate (6 pt/A), mesotrione (8 oz/A), fluazifop (24 fl oz/A), glyphosate (6 pt/A)+ mesotrione (8 oz/A), glyphosate (6 pt/A) + fluazifop (24 fl oz/A), mesotrione (8 oz/A) + fluazifop (24 fl oz/A), and glyphosate (6 pt/A)+ mesotrione (8 oz/A) + fluazifop (24 fl oz/A). All treatment included at 0.25% V/V non-ionic surfactant (NIS). 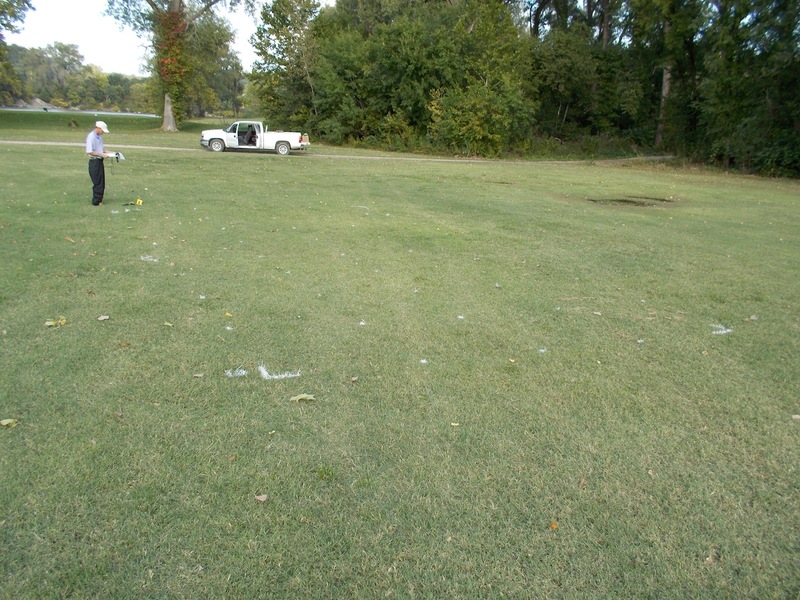 All treatments were 100% brown (dormant) bermudagrass by October 31, 2013. What we found initially is that there were drastic differences between these two locations. Bermduagrass control at the Stagg Hill location out performed the Rocky Ford location. 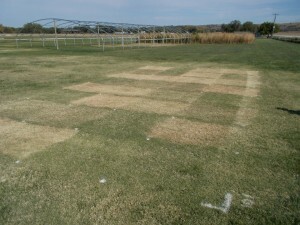 We believe this was due to the differences in bermudagrass cultivars. 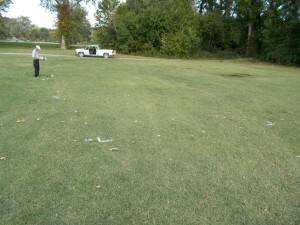 The Rocky Ford Location was ‘Midlawn’ bermudagrass and the Stagg Hill location is a common bermudagrass. 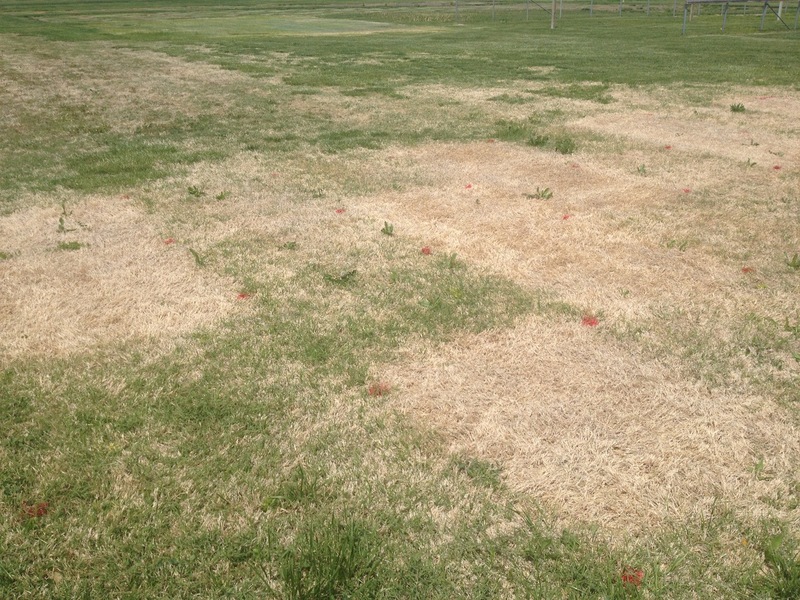 At Rocky Ford the untreated control reached 100% bermudagrass cover on June 12, 2014. 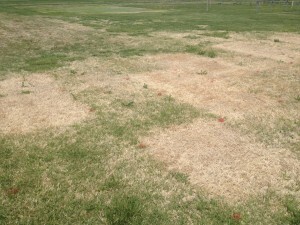 At that time treatments that included glyphosate resulted in <18% bermudagrass green cover. On June 13, 2014 the untreated control at Stagg Hill was 100% green bermudagrass cover. 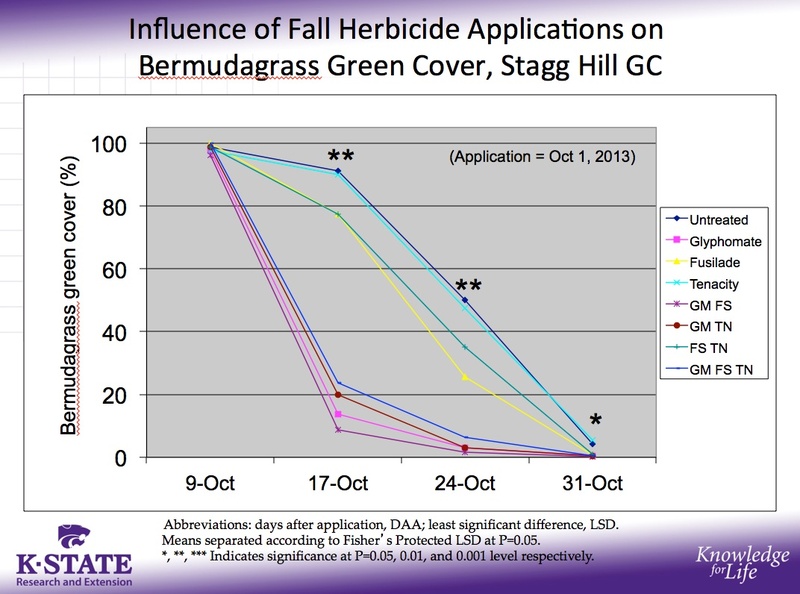 All other treatments that included glyphosate resulted in <9% green bermudagrass cover. What is really surprising is the rating that was conducted just a couple of days ago. At Rocky Ford all bermudagrass treatments recovered to at least 90% green bermudagrass cover by July 14, 2014. But the Stagg Hill location is still showing significantly more control. Glyphosate, glyphosate + fulazifop, glyphosate + mesotrione, and glyphosate + mesotrione + fluazifop resulted in only 27%, 26%, 17%, and 23% green bermudagrass cover, respectively. 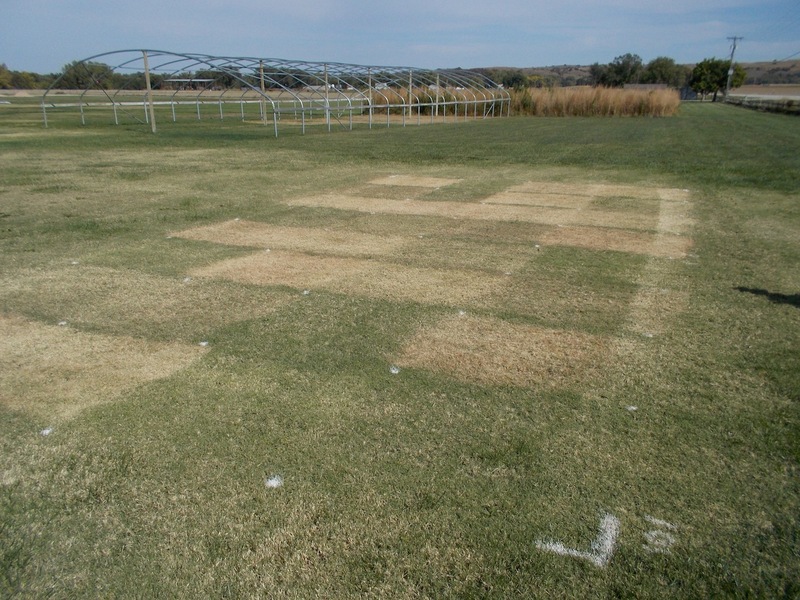 These results suggest that a single application of glyphosate in the Fall prior to bermudagrass dormancy can aid in non-selective bermuagrass removal. We are going to repeat these trials again this year along with trying some Spring applications in combination to see if we can increase bermudagrass control.